I’ve been a pretty big fan of director Michel Gondry for a long time. 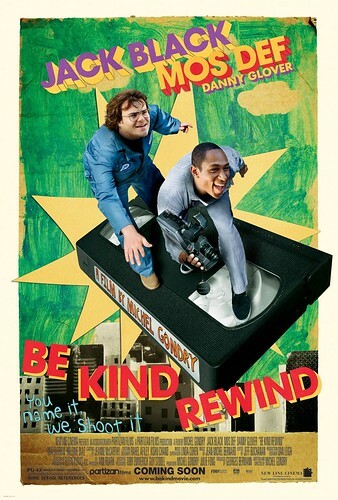 Yesterday I saw his new movie, Be Kind Rewind! Jerry (Jack Black) is a junkyard worker who attempts to sabotage a power plant he suspects of causing his headaches. But he inadvertently causes his brain to become magnetized, leading to the unintentional destruction of all the movies in his friend’s (Mos Def) store. In order to keep the store’s one loyal customer, an elderly lady with a tenuous grasp on reality, the pair re-create a long line of films including The Lion King, Rush Hour, Ghostbusters, When We Were Kings, Back to the Future, Driving Miss Daisy, and Robocop, putting themselves and their townspeople into it. They become the biggest stars in their neighborhood. I’d say more, but I don’t want to give away too much. Just go see it! YouTube Channel for the Movie – Includes mini-trailers for all the remade movies in the movie! YouTube Channel for the Sweding contest – Vote on user submitted awesomeness until March 1st! Deitch Projects Exhibit – See Michel Gondry’s exhibit on the film in NYC. Includes sets from the movie and sets to use to make your own films! I loved it too, so much that I planned a whole outfit of strained film-references around it. I have the biggest crush on Mos Def. Ford Prefect, le sigh. Did you wear that when you went to see it? Oh my g!! I totally forgot he was the director of that movie. I MUST watch it. I love Jack Black too. And so nice to spend some time with you this weekend love!! I put some of those pics up on flickr so you can do a WR!